We love our Melissa and Doug puzzles and bubble toys. I think it's great that their toys and games encourage imaginative, open-ended play for kids of all ages! We are always on the lookout for Melissa and Doug toys to give as gifts and bring into our own home. In addition to this opportunity to win this $200 gift card giveaway, you can also enter to win a 250k Sweepstakes at the Melissa & Doug on Facebook fan page. Each time their fan base grows by 1,000 Facebook fans, a randomly selected fan will win a selection of Melissa & Doug toys. Plus, when the Facebook page reaches 250,000 fans, all fans will receive a special gift. I'm so excited! If you are curious about what real moms thinks about Melissa and Doug toys, you can read these reviews: Baby Costcutters Review, Mom to Bed by 8 Review, Powered By Mom Review. 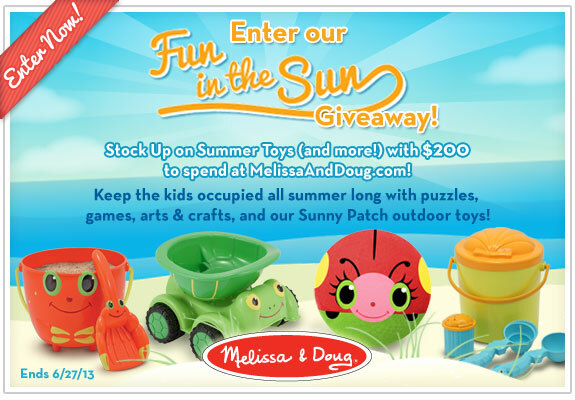 Disclosure: By entering this giveaway you agree to receive email communications from Melissa & Doug. I received no compensation for this publication. My opinions are my own and may differ from those of your own. Why We Love Green and the other participating bloggers in this giveaway event are not responsible for prize shipment. This event was organized by MomPoweredMedia please contact tina@babycostcutters.com or Christine at whywelovegreen@yahoo.com with questions or to see your business or blog featured on the next big event!